Special Themes for “Business Types” ? “Site Totally Deleted”. Not something you ever want to see. And in WordPress—or using any other content management system—if it ever happens you probably won’t even know what it means. I came across the support thread you see here this morning, at WordPress.org. Aside from wanting to be helpful, it struck home for me because it underscores the reason we started The WordPress Helpers; There’s a lot that goes into this WordPress stuff. I could sum up this one by saying it’s about hosting and backup, but that doesn’t go nearly far enough. Is this a problem in all hosting environments? And if it is, what would “backup” even mean in (different types of) “hosting and backup” environment? As I once said at Answer Guy Central, it’s all about everything. One of those posts is stored here, as well; simply put (but it isn’t as simple as maybe you’d like), there’s a lot that goes into this stuff. Only the programming bits are complicated to the point that they’re beyond the reach of most smart-ish people, but without some sort of process in place you’re likely to have problems eventually. Let’s talk hosting and backup. To a point, regardless of where you host your WordPress site, you need to worry about backup. The “you need to worry” part is because … it’s yours. If disaster strikes, nobody will suffer more than you. However, if you build a site in a completely free hosting environment and it’s big enough that you’re certain it won’t go away, you can stop right here. In real-world hosting and backup, nobody can “stop right here”. The only place that you can trust under those circumstance would be wordpress.com, and the only way wordpress.com is completely free is if you limit yourself severely. Those limits aren’t completely out of the question. There are people who use WordPress, at WordPress, are ok with a domain like answerguy.wordpress.com instead of http://answerguy.com, and don’t require any sort of customizations at all to the way their web sites look or act. In fact a few of them are running quite successful businesses that way, so while we almost always recommend against this approach to things, it can work, it’s genuinely free, and flat-out disaster won’t ever happen unless you do something incredibly careless like delete your site, on purpose, and realize later you hadn’t really meant to. “Everyone else” falls into two camps: people who download and install WordPress on their own servers—through hosts, generally; the days of people running servers in their basements ended a while ago—and people who pay for managed hosting, which is pretty much the same thing as staying at wordpress.com, and adding paid features. That’s where the problem you see in the support thread comes up; the person who asked the question had an outstanding bill, and the host deleted his site. Let’s presume that deletion happened “the right way”; the host waited the contractually-defined period and did the contractually defined thing. Let’s also assume that there’s no way, including the payment of a fee, for the files to be retrieved. The site is gone, and the user, not having included a “backup” plan in his hosting and backup process, has nothing. All of it needs to be backed up. There are different ways to do this, and we’ll get to those another day. And there’s actually good news in that there are only two things you need to back up to cover all three of those items; the entire file structure at your host, and the database. Absent a bit of technical knowledge that backup won’t help you (that’s why you hire people like The WordPress Helpers), but it IS “everything”. The little broken picture is something you’ve seen, and something you don’t want on your web site. And that other stuff, the “blockquote” designation, in two different forms? The second one is standard HTML for showing text in the blockquote format. 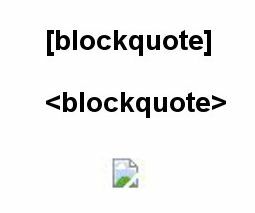 And while your WordPress theme may alter how blockquotes look even without your theme restored some kind of blockquote formatting will show up in a the-database-is-all-I-have site restoration. The first one, though? Without your theme, and perhaps a plug-in that controls extra “shortcodes” it not only won’t look right (inclusion of the citation on the second blockquote in this article is an example), but instead of the content you will literally see the notation for the blockquote-in-square-braces appear in the post! Once your site has any size to it good luck hunting down all the errors. All for lack of a hosting and backup plan. So back up, back-up, and backup some more. Contact us if you need help getting a workable plan for that in place. Just don’t put yourself in the position of “the guy in the support ticket”. 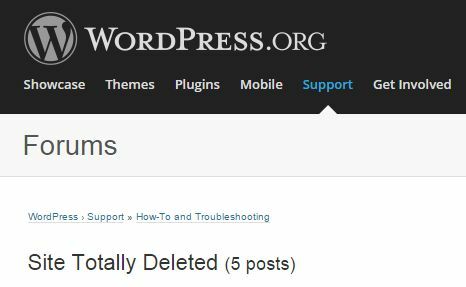 Hosting and Backup and WordPress ... Oh, My!